Possums are nocturnal denizens of our garden and probably the most common backyard wildlife that people are familier with in Australia. They have adapted well to modern urban living and are surprisingly resilient. In New Zealand, where they were imported early last century, they have become a major destructive pest and have been subjected to severe measures to control their numbers. Here in Australia, being native fauna, they are protected and home owners are encouraged to humanely combat unwelcome activities without resorting to removing the offenders out to the bush where they usually cannot survive in unfamilier, and already occupied, territory. Harming these lead footed, prowlers of the night is definately out of the question these days, but unfortunately, in the past, this was not case and posseums were hunted widely, mostly for their fur, or poisoned if a home owner merely considered them a nuisance. Possums are marsupials and our own resident brushtail can often be seen with a little chap peeping out of her pouch; riding on her back; or scampering along a branch beside her. This one pictured loved the parrot seed put out for the Galahs and Rosellas and seemed not to mind us watching or the flash of the camera, as long as we kept a respectful distance and provided the seed of course. 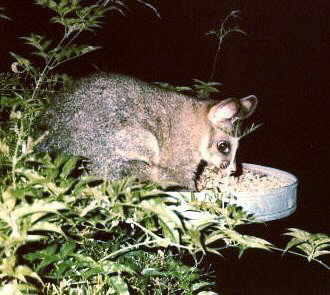 A great favourite in the garden are the pair of ringtail possums that have kindly made our garden their home territory. Ringtails are very much smaller and daintier than brushtail possums being more the size of a small cat. Our own pair are grey and fawn but ringtails also come in more russet colours. They have long, prehensile tails which they use to aid them in climbing and which curl at the end giving them their name. 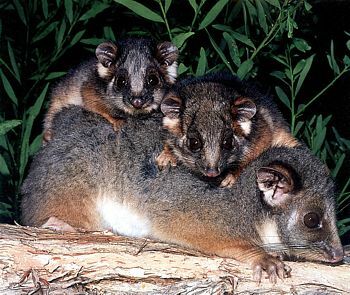 Ringtails are unusual in that they are the only known species of possum where the male takes an active part in the rearing of the young. The male will often be seen carrying the young on his back while their mother is feeding. Ringtails breed between April and November and have between 1 and 4 young, with the usual number being two. The babies of our own pair are abut the size of little hamsters and dangerously cute. Our ringtails have two nests (or dreys) in the garden, that we know of. One is in the upper branches of a large camellia tree. The other is nestled in the moist crown of a tall tree fern close by the front porch. When they choose to nest in the tree fern we are sometimes treated to the delightful sight of the babies tottering about in the dappled shade of the fern fronds while the adults sleep. 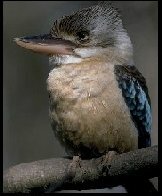 Kookaburras are the largest Kingfishers in the world. Their raucus, laughing call is synonymous with the Australia Bush and most people around the world would recognise this bird as a true blue Aussie. They live in close family groups with older siblings helping their parents raise the present season's young. The diet of Kookaburras consists of small marsupials, rodents, frogs, snakes, other birds and the occasional handout from their human neighbours. There is a resident family group in the Lawson Avenue area that calls by our garden occassionally, expressing their hearty merriment at the odd things they see those strange humans doing in their gardens. They are more than happy though to give a helping hand when the gardener's spade turns up tasty worms, lizards or frogs. If given scraps such as bacon rind, they will fly up in to a nearby gum tree and wack the bacon rind against the tree trunk, as if it were living prey, before they will eat it.